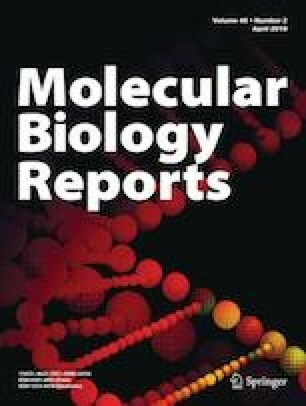 The current study was undertaken to investigate the immunomodulatory and protective effects of Withania somnifera (WS) extract and Withaferin A (WA) supplementation on zinc oxide nanoparticles mediated toxicity in Balb/c mice. The animals were exposed to ZnO NPs along with WS and WA for 28 days and various parameters like body weight, organ coefficient, cytotoxicity, nitric oxide (NO), total serum protein, phagocytosis, and the gene expression levels of TLR6 and ARG genes were determined. In vivo study showed that, dose-dependent reduction in phagocytosis, an increase in the levels of NO production along with up-regulation of TLR6, arginase gene was significant (P < 0.05) when ZnO NPs were given. However toxicity of ZnO NP was reduced in presence of WS and WA with decreased TLR6 over expression and restoration of phagocytic activities. Our results provided a valuable insight into the underlying mechanism for the protective effects of WS. Mechanism of toxicity induced by Zinc oxide nanoparticles ZnO NPs and immunomodulatory protective effects of Withania somnifera extract (WS) and Withaferin A (WA), in Balb/c mice modal of peritoneal macrophages. Red arrows: effect of ZnO NPs independently leads to ROS production which attenuated the phagocytosis of yeast by macrophages through, up-regulation of TLR6 and down-regulation of arginase gene expression. 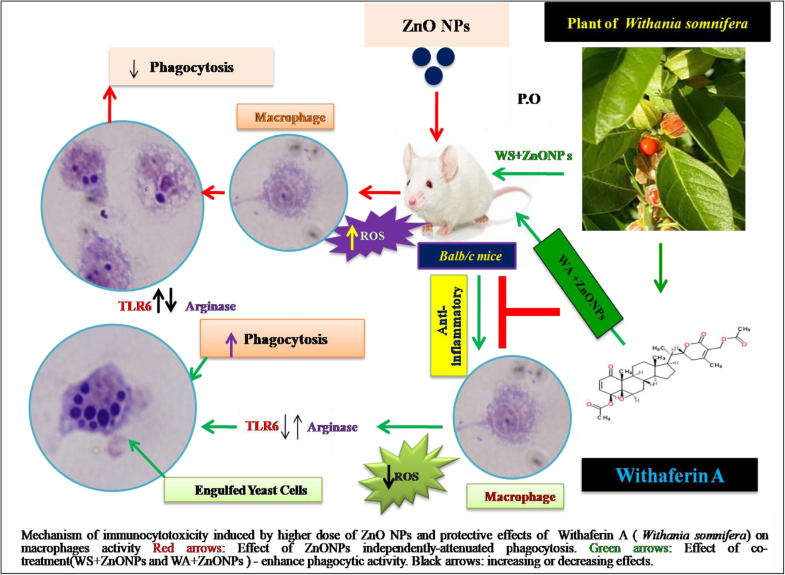 Green arrows: co-treatment, Impact of Withania somnifera extract with zinc oxide nanoparticles (WS + ZnO NPs), Withaferin A along with zinc oxide nanoparticles (WA + ZnO NPs)-enhance phagocytic activity by counteracting mechanism of ZnO NPs toxicity. Black arrows: increasing or decreasing effects. Per oral (P.O). The authors wish to thank the Director, Indian Council of Agriculture Research-National Dairy Research institute, Karnal (Haryana)-132001, India for the research grants. Also thanks to Dr. Sadeesh E. M. and Dr. Chander Datt, M.D. Mitra, Dr. Abhishek, Sandeep, Taruna, Vikash, Kavita Rani, Kush Pandey and Dr. Hanuman, for unconditional support and help during research. Conceived and designed the experiments: JK, performed the experiments; JK, AH and MDM, analyzed the data: JK, AH, and wrote the paper: JK, MDM. This work was financially supported by the Director, Indian Council of Agriculture Research (ICAR)-National Dairy Research institute, Karnal-132001, Haryana, India for the fellowship provided to Jitendra Kumar for research. The authors declare no competing financial interest in our study. All experimental animals were managed according to standard guidelines as approved by the Institutional Animal Ethics Committee (IACE). The approval for this study and experimentation was also taken from Institutional Animal Ethics Committee (Reg. No. 1705/GO/AC/13/CPCSEA), Livestock Research Center, National Dairy Research Institute (ICAR-NDRI), Karnal-132001, Haryana, India.